Poison ivy can be very prolific in your yard and garden. The oily resin is toxic and can cause a severe rash and even lung problems if you try to burn it. There are safe ways to get rid of this unwanted plant. This is a guide to getting rid of poison ivy plants. Try Round-up, it's the best for killing poison ivy. I held a wedding reception at our home a few years ago. The guys put mulch around the trees and house. I found out the mulch also had poison ivy in it. Now the trees and yard are covered with the stuff and I'm severely allergic to it. What can I use to kill it off with out hurting the trees and grass? Unfortunately, I can't think of a product that will selectively kill poison ivy without damaging your trees and grass. Poison ivy is difficult to eradicate, especially if you're severely allergic to it. Still, it's not impossible, but it will take persistence. When working around it, cover yourself from head to toe in heavy clothing. Wear plastic bags over your shoes and change your clothes frequently, scrubbing yourself down with soap and water in-between changes of clothes. Wear gloves on your hands that you can dispose of after use. Also, as you work with the plants, put one of your gloved hands inside a large trash bag so you can use the bag like an outer glove. As you gather up roots and stems, fold the garbage bag over them to minimize contact with clothing. Poison ivy can produce an allergic reaction in any season, but the safest time to work on getting rid of it is in the fall or spring when the leaves are gone and the plant is in its dormant stage. Try clipping the vines down to within 1 inch of the ground and never let them grow any higher. 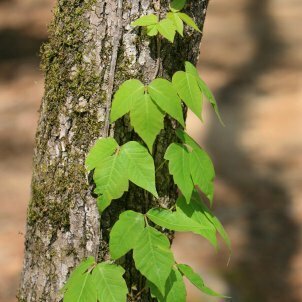 The poison ivy will continue to send up shoots, but the over time the plant will become weakened from a lack of above ground foliage. In the spring when the ground has thawed but the plant is still dormant, try pulling or digging out the roots in areas where there are only small patches. You can mark these areas with stakes now so you can identify their locations in the spring. Where possible, it can also help to cover areas with black plastic sheeting. The plastic should be secured tightly and left for several months; this includes wrapping it around tree trunks covered in the vines. Don't ever mow the plants, as broken bits of the stems, leaves and roots all contain the noxious oils. Don't burn any of the plants, either. The resulting smoke can cause severe lung damage if inhaled. To help thwart the blowing of your Rounup you can use cardboard. Hold the cardboard between what you are spraying and whatever is behind it. You'll minimize the effects of the Roundup on the other plants. And as Chris (we got the same name ;)) said above just kill off the grass and re-seed later...it'll be a headache, but it'll save you a bigger one trying to not spray it. Read the instructions on your roundup before using and it'll tell you when you can replant. This will take several applications, but I've found as the ivy is, well, an ivy, getting to ALL of the roots is nearly impossible. By breaking the soil you are causing the roots to seperate & re-grow. Then by spraying again, you'll find you're getting more of the ivy then just by spraying the leaves. I'm not allergic to the poison plants so I just dig in with my hands *evil grin* but the better majority of the population is not like me...so you'll have to find someone like me, or do it all the hard way. * DO NOT BURN the poison ivy (not even the dead stuff). You'll get the oils in your mouth & lungs and trust me, that AIN'T PURDY! * If you use an off-brand of roundup, be sure it's active ingredients match (including the amount of them). I am also severely allergic to ivy, oak and sumac-- if I get another dose like the last time-- trying to rid my daughter's back yard of oak-- I will be in hospital!! Probably in ICU. These folks have given you good advice-- I'll add one more-- hire someone to do the application-- don't do it yourself-- with this strong a reaction-- there is no way you cannot get a dose. up even where we planted grass. We live in a very wooded area which we cleared out. I hope to find a natural, no herbicide way, to get rid of the poison ivy. Thanks for any help. I've scanned the old responses, and I'm curious to see what new ones come in. We have some poison ivy that has come back for a few years now. About three years ago I didn't know what it was (early spring clean up), and I ended up with horrible rashes on both forearms. I had it for about a month when I happened to be at the doctor's office for something else, and he said he thought it was poison ivy. Nice to know. My husband and I are discussing hiring someone to get rid of it for us. *I* don't want to risk getting it on me again. I've read that the roots can cause the rash (and the plants spread by runners), and that the oil on old, dead foliage will cause the rash. If you are in a rural area, you might want to consider goats. I understand they will eat poison ivy. If you think it could be feasible for you, try reasearching goats! If you do get poison ivy, apply tea tree oil (found in the over the counter pharmacy section or in health food stores). It reduces the itch and also has antibiotic properties to reduce the chance of infection. If you have to hand-pull the stuff, there are products available at the pharmacy that you can apply to your skin before working around poison ivy that will supposedly block the oils from bonding with your skin. I'd use that, then dress to cover as much skin as possible, including gloves. Loosen plants with long-handled garden tools. Take a stash of grocery store plastic shopping bags, stick your hand in one, and fold it back up your arm. Grab the plant, and fold the bag down over it. Stick in trash. Repeat as needed. When finished, remove all clothing, toss in washer (shoes too), and shower ASAP in lukewarm water. Lots of water is more important than soap! You may find special washes at the pharmacy, but if you were careful with the plastic bags, you hopefully won't need them. 1 gallon of vinegar, 1 cup of Salt 6 squirting of dishsoap, apply with sprayer the poison ivy will turn brown and die! I have some areas of my garden and yard that are infested with poison ivy. Any suggestions on how to safely get rid of it? Whatever you do, do not burn it. Do you live in the country? If you do ask to borrow someones goat [not a joke]. Golf courses bring goats onto the course to eat the grass and the poison ivy. The goats like poison ivy and it does not make them sick either! How can I kill Poison Ivy? Call a gardening center and do your own search on Google. You could buy chemcials at a garden store or big box store. You could also dig up the plants. What ever method you use wear gloves and do not burn the poison ivy. Onct the leaves are broken they emit the chemical that will cause a rash. Burning the leaves put this chemical in the air that can be ingested into your air ways.Some options to consider to get rid of poison ivy include. Spray the poison ivy plants with an herbicide, such as Roundup or Ortho Poison Ivy Killer, keeping in mind that they can also kill surrounding plants too. If removing the poison ivy plants on your own, be sure to wear protection and keep in mind that Urushiol can remain on your clothing and gloves, etc., causing a rash if you later touch them. Also, be sure to properly dispose of the poison ivy plants, since even a dead poison ivy plant can trigger a reaction, and never burn a poison ivy plant, as that can trigger a deadly reaction to anyone who is exposed to the smoke. Will the homemade weed killer work on poison ivy? We have just a few spots around our garden bed and were wondering if it will kill the ivy? Does anyone know how to totally kill poison ivy, oak, etc. without herbicides? I have pulled it over and over and ended up in the ER. I cannot use the herbicides due to my liver, but must get rid of these plants. I'm very allergic and have also had problems in the past. A garden friend taught me to take a plastic grocery bag, and pull the plant out using the bag as a glove. I then turn the bag inside out with the poison ivy, root and all, inside. Tie it shut and put it in the trash. It works best when the plant is still fairly small but you could just use a bigger bag if it's larger. I have some poison ivy growing around my grapevines. I need to kill it, but am afraid to use anything that might leach into my grapes. Does anyone have a solution? Right now, I'm pretty much covered with the rash around my neck, face and arms. Right now the only true way to get rid of poison ivy is to remove the plant by hand. I buy large thick yellow kitchen gloves, wear long sleeves and long pants and dig them out. There is a product you can buy in any lawn and garden, big box or drug store. It is called Technu, it is made of mineral spirits and you wash your clothes and tools off after you have pulled up the Ivy. We have a hay field of about 6 acres. It has become overrun with poison ivy. Any ideas of how to eliminate it without destroying the hay? The best way to eradicate poison ivy from such a big area is probably by repeated mowing or grazing the areas heavily for several years (sheep and goats apparently show no ill effects when eating it). Repeatedly taking poison ivy down to soil level will eventually cause the roots to die out. Unfortunately, this does nothing to spare your hay. Even when using chemicals like Brush-B-Gone, which is non-selective and also very toxic, poison ivy is difficult to get rid of in small areas. The size of your field makes eliminating it all the more challenging. Some sources recommend repeated mowing followed by plowing it under to control it in large agricultural areas. Not knowing your situation (whether you need to use the hay for your own livestock or you sell it to others as a cash crop, etc. ), I don't know if this is even an option for you. You could try checking with your county extension agency http://www.umassextension.org/index.html or the Massachusetts Department of Agricultural Resources http://www.mass.gov/agr/. Their sites may also offer you links to helpful information. How do I kill poison ivy? It has grown excessively this spring. Thanks. How do you get rid of poison ivy plants? I found a very inexpensive way to kill poison ivy in my yard. Spray the area with a mixture of 2 gallons soapy water and 3 lbs. of salt. The already mixed solutions at the garden store are very costly. It only takes a few minutes to mix up your own. I have so much poison ivy growing all throughout my trees and bushes. I tried to get rid of them by pouring vinegar but it didn't work. I have a dog so I don't want to use any harmful chemicals. Does anyone have any ideas on how I can get rid of them? I can get rid of the trouble if I get in contact with it. Scrub with a rich lather of homemade lye soap and I can handle the stuff with my bear hands but how do I eradicate it all together?